Dancing in the Rain: Link the Love! 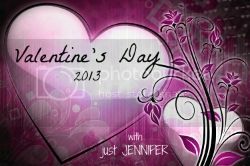 As promised, here is your super special and shiny Valentine's Day link-up! What is your dream Valentine's gift? Valentine's Day is pretty hit or miss around here. What we do or don't do varies from year to year. This year I found something yummy for Mark and I to have for a late dinner (he will be at work until 7:00), and my dad is going to bring the kids tacos. I think that's about it. It's pretty much just an excuse to have something special for dinner and eat chocolate! So what about you? Tell me all about it!